During the three or four months of the rainy season, called “vassana,” the Buddha and his followers would encamp on open land outside of cities—usually reserves owned by wealthy patrons—and invite lay practitioners to join the monks and other disciples for meditation, communal work and instruction in the Dharma. Chinese and Japanese Zen communities continued the observance of intensive 90-day periods of practice and incorporated special training for a monk or layperson who would be designated as “head monk” or “head trainee” into these seasonal retreats. This position, called Shuso, entails close work with the Zen teacher on a single koan for the duration of ango. At the Hazy Moon, ango is usually held from May through July. Ango culminates with the traditional Shuso Hossen ceremony, when the monk or lay practitioner who has occupied the Shuso’s seat gives a talk on the koan she or he has been working to penetrate. 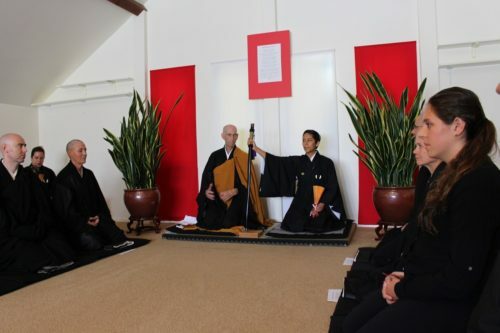 That presentation is immediately followed by Dharma combat—a lively exchange between the Shuso or head trainee and junior priests, lay practitioners and invited guests. Ango and Shuso Hossen are essential components of the life of the Hazy Moon, embodying our reverence for the Three Treasures (Buddha, Dharma and sangha) as well as our belief that ardent commitment to Zen practice is the surest way to liberate ourselves and our world from suffering. Check our schedule page regularly to find out when you can participate in Ango, retreats and other events. Please join us!